While leases may appear to offer more car for the money, consumers don't have anything to show for their monthly payments at the end of the lease and often find themselves facing lots of unexpected costs, including excess mileage, charges for minor damage, and the ubiquitous "end of lease fee," which is just what it sounds like, a fee for nothing. This generated some rather heated responses from car salesmen, like Richard, a Toyota salesman who said our warning about lease-end fees was "completely false" and recommended we do more research. So we did and found a recent ConsumerAffairs review by Susan of Madera, Calif., who said she had leased a Toyota Prius in 2013 and purchased a Sienna in 2014. She also talked her father into buying a Tundra. But then: "Two months ago I returned my lease, and the way Toyota repaid us for being great customers was to charge me $350 at the end of my lease for not buying through Toyota Financial again. Even though we bought a new Sienna after the Prius, and even after my dad bought the Tundra." It doesn't happen only in California. George of Manahawkin, N.J., recently turned in his 2012 Rav4 at the end of the lease. "Two months after I returned the car I received $350 fee + tax. I have owned/leased five Toyotas since 1990. There was no disposition fee assessed to the contract for any of these vehicles. They never disclosed this fee to me or I would have never leased the vehicle in the first place," George said. Justin of Howell, N.J., is also fuming about the end-of-lease fee. Justin paid off his lease early and asked Toyota Financial if it would waive the $350 "disposition fee" at the end of the lease term. "I suggested that they change the wording to 'Continued Customer Waiver' to represent a more accurate description of what the waiver really represents. In addition, I suggested that they change their contracts to fully disclose the disposition fee in bold and put a line for customers to initial next to it so that they have an opportunity to negotiate the waiver prior to signing the contract. No dealership should be allowed to use the word Loyalty in this waiver as it is deceptive and misleading," Justin said. These and many other consumer reviews in our database would seem to contradict the claims made by Richard the Toyota salesman, who said flatly: "Toyota, in my close to twenty years with them, has never charged a 'lease end fee.' Completely false." Richard also objected to our mentioning charges for damage and excessive wear, saying that Toyota is "very liberal" in overlooking minor dings and dents. But Dennis of Oil City, Pa., says he found Toyota to be very liberal in assessing damages. "I leased a 2010 Rav 4, had the pre-inspection, and there was nothing the matter. I turned the vehicle in and get a bill for $429.46 for excessive wear and use. I had 28,000 miles on it. They say there was a 12-inch scratch on it, it wasn't there when I turned it in. It sat in a parking lot for approximately 3 weeks before they picked it up. Who knows what happened in that time frame!" he said. 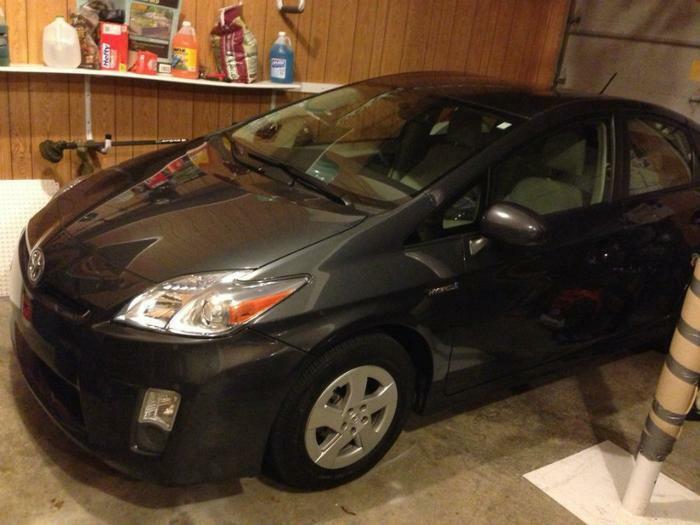 John of Olathe, Kansas, sent us a photo of his Prius (above) to illustrate his dismay with Toyota's end-of-lease inspection. "I cannot believe we have babied our Toyota Prius on a lease through Toyota. I had the inspection yesterday and they said that I need to have the bumper, hood, and roof reconditioned (look at the picture). This is probably the best lease return Toyota will get," John said. "I take complete care of all of my vehicles and have never experienced something so unjust. My experience leasing from other companies is completely different." Toyota salesman Richard took special umbrage at our statement that consumers should consider that after making payments for three or more years, at the end of the lease they are basically left with nothing. Not true, said Richard: "I think the most untrue statement is that 'consumers don't have anything to show for their monthly payments. As some one [sic] who leased thousands of Toyota's [sic] to people, I vehemently disagree. A wise consumer leasing a Toyota can typically re-lease right around 30 months of a 36 month lease. Using their equity that they accumulated they can choose to lower the payment on their next lease, or purchase another vehicle. Additionally, they can just re-lease and take a check for the equity. All those options are more than you let on in your article." Could be, but while some consumers may have the experience Richard describes, others wind up like Ronald of Torrington, Conn.
"Terminated my lease early (3 months). Turned the vehicle into a Toyota dealer for another lease. Received a letter from Toyota Financial Services demanding that I pay the remaining three months left on the lease. I paid the amount they requested," he said. "Six months later, I received a letter from a debt collection company hired by Toyota Financial services demanding $1249.76." Then there's Yvonne of Rialto, Calif.: "I was leasing my vehicle through Toyota, then purchased it. The finance department tacked on the residual. I am paying $58,000 by the time I finished paying for this vehicle in 2016, after already paying for four years of payments." "My payments are $540 a month, which is extremely hard for nine consecutive years." Yvonne, like many consumers, has failed to fully understand the nature of a lease. For the three or four years that she was leasing the car, she was merely paying for using it, not making any payment towards the residual, which is what the buyer and the manufacturer agree the car will be worth at the end of the lease. If a consumer turns the car in at the end of the lease, the car is gone and so is the money. If they buy it, as Yvonne did, it is a separate transaction in which the consumer pays the residual. So, yes, Yvonne could very well pay $58,000 over nine years, depending on the length of the lease, her down payment, the residual value, and so forth. Consumers often buy cars at the end of the lease term, thinking they have -- as Richard suggests and as Yvonne perhaps believed -- built up equity in the car. In fact, they have merely paid for using it and have not taken even a chip out of the residual in most cases. Oftentimes, consumers would be better off turning in their leased car and shopping for a used car of similar vintage if they don't want to lease a new one. They would at least have some bargaining position as a prospective buyer, whereas at the end of a lease, the consumer is in a poor bargaining position since she has already agreed to pay the residual price if she decides to purchase. If you're thinking of leasing a car, it's important to decide up front what's important to you. A lease may be at least partly tax deductible in some cases -- sales and property taxes are generally less and the monthly payment is generally lower. If having a new car every few years is important to you, there's nothing wrong with leasing, but it means you'll never get to the day when you make your last payment and own your car free and clear. Automotive site Edmunds.com has a set of online calculators that can help you run the numbers and decide what's best for you. Oh, one other thing to keep in mind: leasing a car is not like renting one from Hertz or Avis. The lease lasts for as long as the contract says it does -- 24, 36, or 48 months usually. Many consumers think they can end the lease early if their situation changes, which is not usually the case. There are, however, cases when a lease might end early whether anyone wants it to or not. We heard recently from Laurie of Los Angeles, whose husband of 47 years died last August after leasing cars from Jim Falk Lexus for more than 12 years. "I didn't want the car out front as a reminder so I called Jim Falk Lexus. They were unsympathetic and said I was responsible for the lease," she said. "I called Lexus Financial and they told me they would come get the car and auction it off and we would figure out something. At the same time they sent a collection agency to go after me." "It has not even been a month as a widow and you are sending dogs to bother me in my grief! This is outrageous. I am horrified that after being such good customers you are this heartless and cruel," she said in a ConsumerAffairs review. In fact, if her name is not on the lease, Laurie is not personally responsible and does not have to pay another cent, said an attorney we asked about this case. Her husband's estate may, of course, be liable for the unpaid portion of the lease. That's something for the estate's executor to work out. In Lexus' defense, turning the case over to a collection agency may sound heartless but it may well be the company's standard procedure for any case in which the consumer is unable or unwilling to continue to make payments. Auctioning the car and using the proceeds to pay off as much of the remaining term as possible is a reasonable way to proceed, the attorney said, even though it may sound heartless.